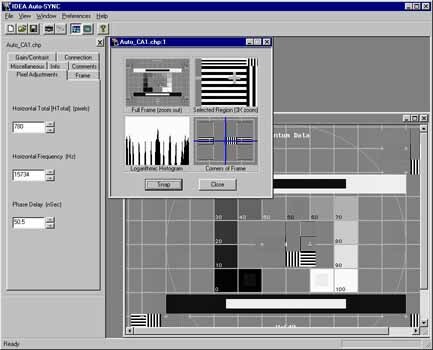 Auto-SYNC is Foresight Imaging's revolutionary automatic configuration software. Unique in the industry, Auto-SYNC analyzes the video signal that is connected to a AccuStream or I-Series frame grabber and automatically detects the various video parameters to ensure the highest quality video capture possible. Auto-SYNC detects the pixel clock rate, horizontal and vertical resolution, phase, black level, gain, reference, sync level, blanking, horizontal frequency and much more. Never again do you have to manually analyze a video signal with an oscilloscope or even "plug in" values for different parameters with the traditional "trial and error" method. Auto-SYNC analyzes any video signal up to 200 MHz and up to 4,000 x 4,000 in resolution and automatically configures the AccuStream or I-Series frame grabber to capture the best possible image. This automatic analysis saves hours in setup, installation, and diagnostic time. Just run Auto-SYNC and several seconds or a few minutes later, you are capturing high quality images from virtually any source. Auto-SYNC, included free with every AccuStream and I-Series frame grabber, offers much more than automatic video analysis and configuration. Auto-SYNC allows you to fully adjust your incoming video signal by tweaking the black level, gain, and reference. You can adjust the horizontal and vertical resolutions to select an area of interest to capture. Auto-SYNC also provides a histogram of the captured image, a subsampled view, a four corner view, and a 3X zoom of a user-specified portion of the image. A pixel reader always provides the pixel coordinates and gray level of the pixel specified. Images can be saved and retrieved in BMP and TIFF formats. Auto-SYNC is an excellent tool for automated video analysis and for tweaking and adjusting incoming video signals. It makes configuring a frame grabber to capture high quality images from non-standard video sources fast and easy. End users, OEMs, and systems developers find Auto-SYNC to be an indispensable tool for fast and reliable video connections, especially for non-standard video sources, in medical imaging, scientific imaging, and machine vision. For OEMs, the functionality of Auto-SYNC is available as a callable software library in the IDEA Software Development Kit. Please see the IDEA Software data sheet for further information.